Please step away from the wall... 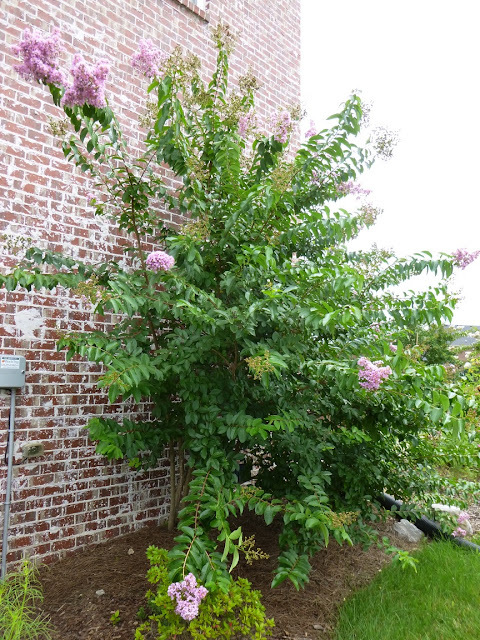 Surely whoever planted this Crape Myrtle realized that it might grow more than 3-inches wide? Generally speaking, if a plant is supposed to grow say 20-feet wide, experts recommend planting it at least ~12 feet from a building, so that it can grow to its maximum width and still give you a little space to get between the building and the plant for pruning, painting, window washing, etc. When we moved into this house a bit over 2 years ago, we noticed that a number of the foundation plants were sited too close to walls and steps. Some of those (the Nellie Stevens hollies) we removed. Some of them (the camellias flanking the front steps, another camellia planted alongside the front wall) have stayed. I can't bear to part with them and I'm concerned any attempt to moved them by 1-2 feet would be detrimental to their health. But there's one plant that's planted WAY too close for comfort to a side wall - the lavender crape myrtle pictured in the photo above. 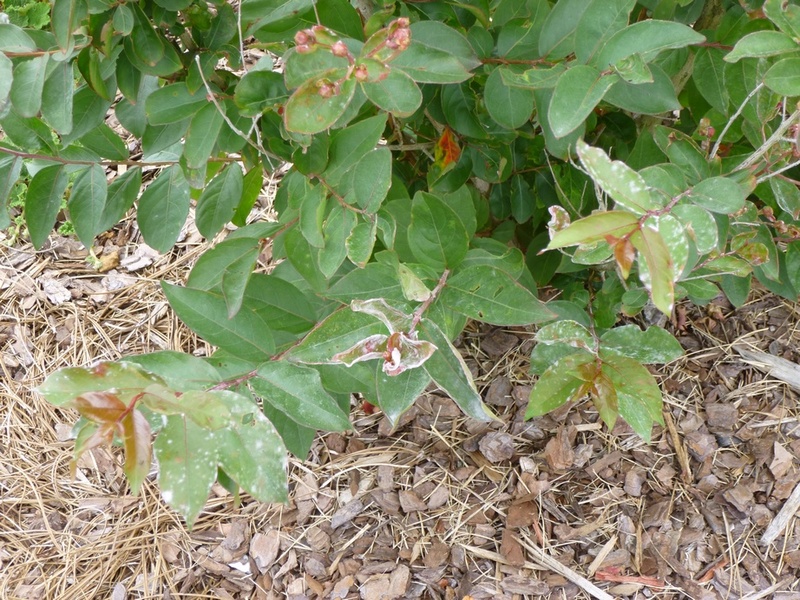 I can't be sure (since there are so many crape myrtle cultivars), but I think this could be Muskogee, one of the superior USDA introductions that is resistant to powdery mildew. Personally, I've decided that I like the white-flowered crape myrtles (such as Natchez) best. Most of the others seem a bit too garish for my tastes. Plus the white-flowered ones seem to attract the most bees! But I do think that the light-lavender flowers of Muskogee (if that's what it is) are probably my favorite among the colored varieties. So it's painful to think of getting rid of the tree, but we're talking about a plant that will wants to grow 25-feet tall and 20-feet wide being planted 3-inches from the wall!! Really? Who thought it was OK to plant a full-size crape myrtle this close to a house?? This is a beautiful plant, but it's just in the wrong place. 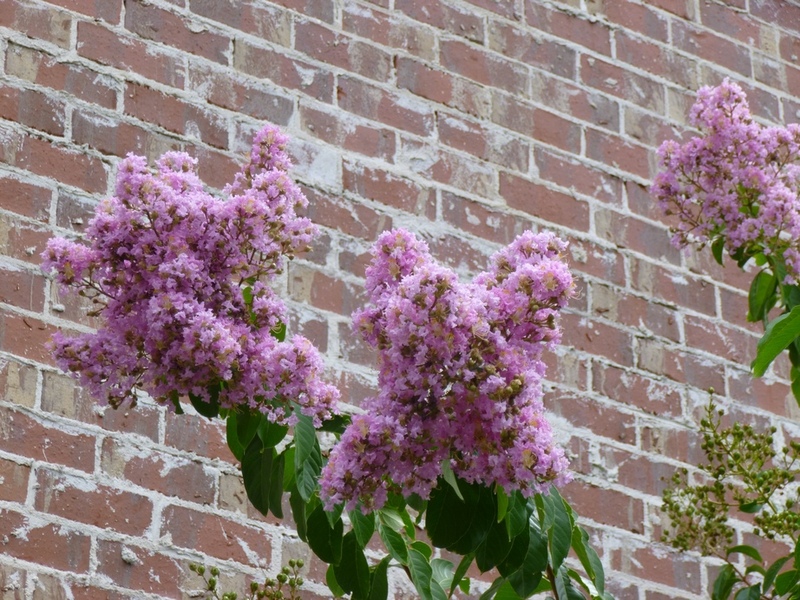 Even if it were a couple-feet away from the wall, that still wouldn't make any sense with this type of crape myrtle. So unfortunately I think I have to commit real crape murder (not the crape murder that involves drastic annual pruning techniques). My plan is to cut the plant down to the ground using loppers and a chainsaw. From what I understand, crape myrtles don't die easy. Most likely, the plant will send up a thicket of suckers in an effort to survive. Now many websites suggest drilling a hole into the trunk and pouring in concentrated herbicide, but I am reluctant to use such chemicals. I thought I could try to dig out as many of the roots as possible and then regularly cut off any suckers that sprout. I imagine it might take a few years, but that the tree would eventually weaken and die. What do you think? Is this a foolhardy idea? Should I bite the bullet and ask a trained landscaper to come over and remove the tree and/or inject poison into the stump? Also...Should I be worried about a large Natchez crape (15-20 feet tall already) that is planted perhaps 4-feet away from another wall of the house -- again, that seems way too close to me. Thoughts and advice are welcome!! PS - I probably will also be removing 2 of the 3 crape myrtles that I planted just last year. One of those, Petite Snow, has not put on any new growth at all, nor has it bloomed this year. And the leaves do not even resemble the Petite Snow photos I've seen online, which makes me think that it might have been mislabeled. New Geronimo crape myrtle leaves afflicted by powdery mildew are twisted and disfigured. Not what you want to see at the front foundation of your home . 1) I still have the tag that came with the plant where the size is given as 10-feet tall by 6-8 feet wide. Maybe that's a little big, but not too crazy for a corner foundation planting. But on Flowerwood's own website, Geronimo is now listed as growing 15-20 feet tall by 12-15 feet wide. So...basically I'm looking at another monster crape planted right against the foundation. No thanks. I'll dig it out this autumn while it should still (theoretically) be easy to do so. Geronimo crape myrtle flower buds afflicted with powdery mildew. Based on my experience with mildew on a different crape, these buds will not open. 2) If that was the only issue, I'd consider replanting the crape somewhere else on my property, but Geronimo also has major issues with powdery mildew, as you can see in the two photos above. The thing that bugs me is that Flowerwood chose a Native American-sounding name for this crape myrtle. And it just so happens that many of the highest-rated mildew-resistant crape myrtle cultivars from the US National Arboretum (USNA) are known for having Native American names. Texas A&M even says: "As a general rule, cultivars with name of a Native American tribe will be resistant to powdery mildew." Guess they'll have to revise that general rule now thanks to Geronimo. Caveat emptor! Cut it down! And make sure you get the trunk and root-ball... otherwise it will continue to grow, possibly affecting your foundation. But I'll probably follow another commenter's suggestion to try to cut it way back in the winter and then try transplanting it. No guarantee of success, but at least a shot at saving what is actually a very pretty tree...just in the wrong place. But thank you for your advice! I was going to suggest you cut it down and then try to move it, but I see you have already decided to do that. I have moved one and it succeeded, but it may depend on the cultivar. I keep my crape myrtles compact by cutting them back hard every winter (cutting off about 2/3 of the new growth) so they can fit into a smaller space. I have one that's only 2 feet from a hedge, which is too close, but it's manageable. I do cut off all backward-facing branches completely. If I had room, though, I'd let them grow big. Thanks Lyn. Yep, I've decided to try the cut-it-down-and-transplant approach. 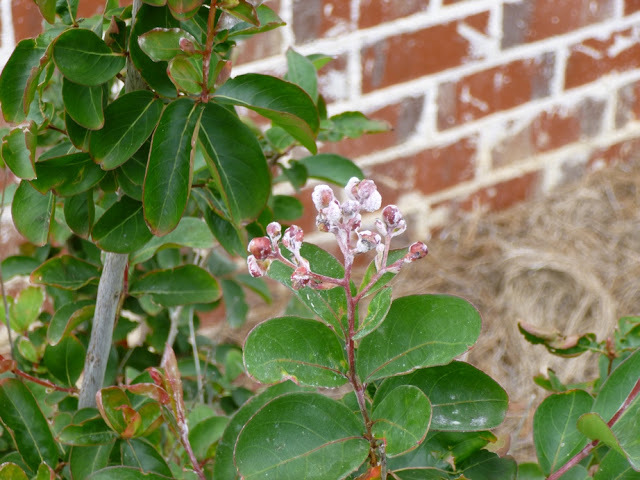 Your crape myrtle pruning strategy sounds sensible. I need to do some pruning this winter on the Natchez planted a few feet from the house. But I have four other Natchez crapes (that I didn't plant) that are surrounding a patio behind the house. I'm letting those grow big and wild - mostly untrimmed - because we have very little privacy behind our house except for those crapes. Even in the two years we've been here they have already grown to give us quite a good deal of privacy and I hope they'll will give more and more in years to come! The brainless builders strike again. What a shame. It sounds as if you do need to move or remove the tree closest to your house, but the large Natchez crape myrtle that is 4 feet away might be ok. You might have to prune some of the branches if they start encroaching, but I've seen similarly sited plants here in my neighborhood and the trees and the homeowners seem to be able to deal with it. By the way, I have discovered the hard way that plant heights listed on tags are always wrong, or at least in my garden. In the south with all the heat, things seem to get much, much bigger. My Purple Dome aster is almost 3 feet tall and it's supposed to be 18 inches. That's a valuable point, Sarah. I think you're right. And I will try to keep the Natchez as-is and just give it a hefty haircut this winter. I value the leafy privacy it provides from a couple of windows on that side of the house. 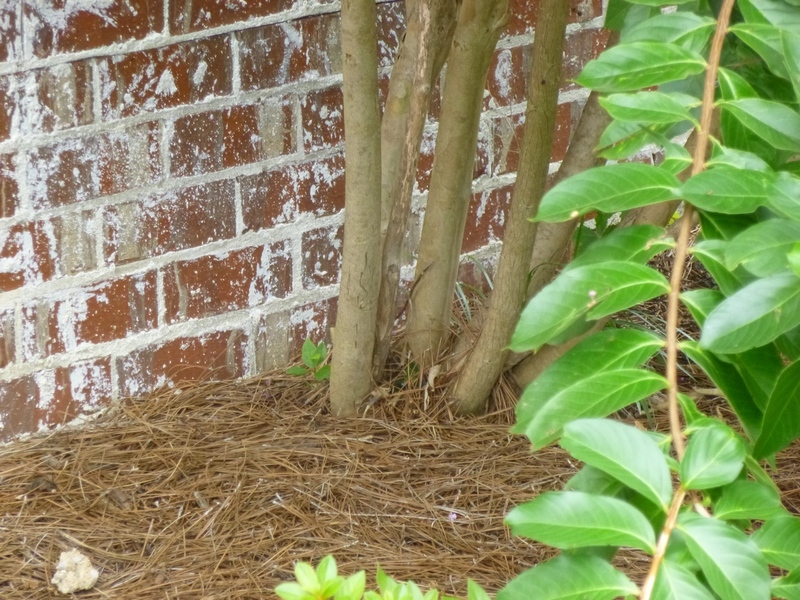 Crape myrtles are fairly shallow rooted so you should be able to dig it up easier than you think. I'd give that a try with the lavender. I have the same one in my garden and it's a keeper. I'd get rid of the other one. That may be because crape myrtles are so ubiquitous in the south that they're considered disposable. The advice may be biased towards how accessible they are rather than towards saving a plant you can buy at Lowe's. Go with your gut. I hope you do try to transplant it. In my experience, crape myrtles are hard to kill, and I would guess that it would transplant fine, with a little water and care afterward. I have a vitex that I myself planted too close to the house! (Not three inches!) It's always a difficult decision to decide whether to chalk it up to experience and kill it or go through the agonizing process of trying to transplant something that is very happy where it is (or just leaving it and pretending it's fine!). As for your Natchez - I think 4 ft is o.k. Just make sure that your shingles won't get torn off by the limbs swaying in the wind. But I probably will leave the Natchez in place and just cut it back a bit. I planted my vitex a few feet from the house. I'm not too concerned though. I figure I can always cut it back if that becomes necessary. Thanks for the suggestion, Maurice. How Much Biodiversity Do We Need in Suburbia?